Sometimes grout becomes a bit dingy and needs to be renewed. 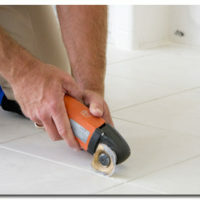 Color sealing is the practice of “painting” grout to give it a fresh look and protect it from future wear and tear. Sealing requires the use of acid based chemicals. To ensure the safety of your home and everyone in it, indoor-use products must be selected. It’s highly recommended that you hand the responsibility of handling these products over to a trained and experienced professional. Decorative, low-traffic rooms are the best place to have color sealing performed. With fewer feet traveling over the area, the newly sealed grout will look great for a long time to come. The new sealing color should be close to the original color. Choosing a different color could cause the underlying color to be seen when sunlight shines on it. Talking with a professional grout company can help ensure that you get the products best suited for your unique project. Sanded grout can be painted easier than the unsanded grout (like what’s found in your kitchen and bathroom). Mopping and cleaning your floors regularly can help keep them looking great, but over time, it can cause the color of the grout to crack and fade. When this happens, you should consult with a professional color sealing expert to discuss a touchup. This could save you time, money and effort in the long run.